The Undying Woods grew up around the maradan graveyard, home of neglected zombie marapets. After Elger the witch moved into her haunted house and brave marapets started to venture in for quests, a pound was opened to house the poor unwanted homeless pets and several shops have sprung up to take advantage of passing trade. Keep your wits about you as you pass though this world - you never know what might be lurking in the shadows! Bid on items that other players have put up for auction to grab a bargain. Your battle deck is where you collect trading cards you can battle in the arena. Beelzebub visits randomly in October causing chaos and giving out prizes. Visit the clock tower to find out the current time in Marada and you may receive a prize. The gate of the graveyard is where neglected pets go before they permanently die. Complete goals related to the Undying Woods world and receive a prize at each level. When you catch the grave keeper sleeping, rob a grave for some bones. The graveyard is where neglected pets that have died go and become zombies. 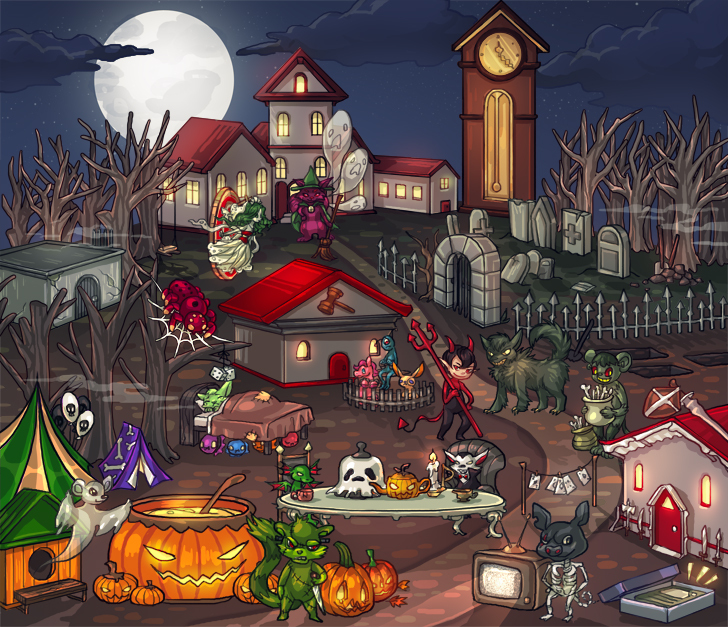 Buy the halloween treats you need from this shop - popular around Halloween! Complete Elger's quests and you may win crystals to train your pets at the Gym. Visit the open graves gave, select a grave and you may win a prize. The only way that you can sell your non limited edition pets for MP is at the Pet Auctions. Adopt a new pet disowned by another player or disown a pet you no longer want. Buy trading cards, add them to your battle deck and fight in the battle arena. Complete this mission for DVDs and you will receive a limited edition Zoink pet. A free game you can play once every 4 hours to win a prize from the Undying Fairy. Collect bones and bring some blood and you can create your own Undying Minipet. Play the free Undying Tombola game and you may receive a prize. Vampire rewards each of your pets prizes for training health stats. Buy the weapons you need to battle your pet in the arena from this shop.